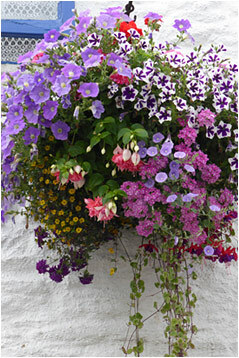 We can make new hanging baskets or containers or we also fill you existing containers. Our most popular basket is the 16" iron basket which has at least 15 plants in it however we also make smaller wire baskets, moss basket, wicker and plastic baskets depending on your budget and preference. We also fill mangers of all different sizes, pots and have been known to fill watering cans, wellie boots and wheel barrows full of lovely plants and flowers.